... 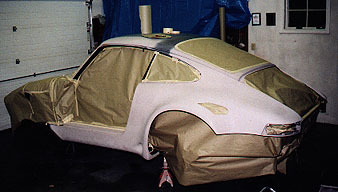 Builds a 911 GT3 Racer from the Ground Up. 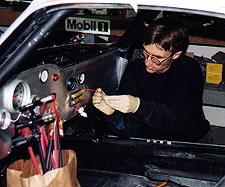 During the winter of 96-97, I tube framed the front of my friend Dan Galyon's 911. We decided going in that that was enough of a project for one season, and we were right. 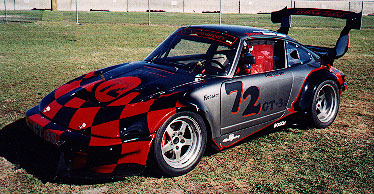 Nearly 3 months of hard work to get the car ready for the first PCA Club Race of the season at Sebring in February. As is usual with racing, I didn't finish all the details until we were at the track! It was a real grind (no pun intended! ), but the results were thrilling. As I had hoped and anticipated, Dan came in after only one run session and positively raved about the solid feel of the car. He said it turned in so hard and so quick he nearly hit the inside wall numerous times on the first lap! He was stoked. I was quite satisfied - thank you very much - but not nearly finished yet! Throughout that summer, the car and driver package improved and got quicker, but it was not as quick as my mind. While I had been working to complete the front end project, my brain was working out the details of continuing the chassis upgrades. I wanted to rip out that disgusting cage in the worst way! As you can see by the photo, it was a thicket of tubes running in all directions. Not only was it not structurally sensible, but it compromized the interior space of the car trememdously, and was also down right dangerous. Some of the tubes in there are chrome molly, and I knew darn well that the body shop Dan had employed knew nothing about handling that special alloy. I began lobbying early on for a continuation of the project, pointing out examples of good design and construction in other cars and asking Dan to compare those with his chassis. As I had said earlier, Dan is a smart guy, and also likes things to be of high quality. The two of us are definitely into quality as a point of pride. Honestly, it didn't take that much convincing, and after the 96-97 racing season ended, we dove in again. As usual, you do a lot of tearing down before you build back up. As you can see, the air chisel and cutoff saw were busy once more. 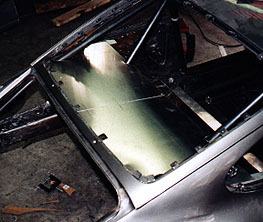 In fact, the only substantial pieces of factory sheetmetal left are the roof and floor! All the rest is redundant and heavy. It is much better removed and replaced with lightweight aluminum panels that are also removable for easy access to mechanical componentry. 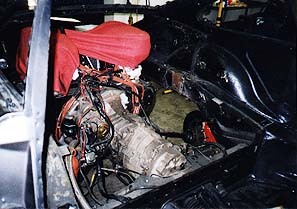 Incidentally, the engine was eventually removed for greater access and also to protect it. 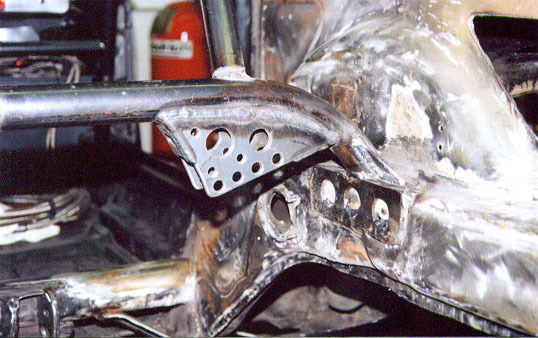 The first step in rebuilding was constructing a new rear suspension crossmember. This car utilizes coil-over shocks, and the original shock mouning points are too small for these units. Furthermore, the strength of the original stamped steel unit is not up to the rigors of 500-800lb springs! It is not uncommon for even uprated shocks alone to blow right through the original shock mounts, so the addition of spring loading in this area as well just doesn't cut it. The new unit was fabricated from 0.750" x 0.120 ID mild seel roll cage stock, and makes a perfect platform for not only suspension mounting, but tying into the rest of the cage as well. As always, we're shooting for maximum chassis rigidity. Incidentally, as you can see, the artistic shape and detailing of the shock mount plates is typical of REDLINE Quality. You may not always be able to see it, but it's there... and it counts! hoop at the point where it is welded to the door post (#5), and runs back to a crossbar behind the rear bumper. 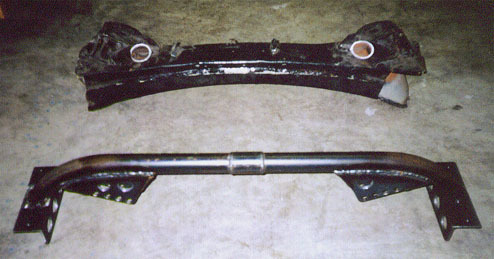 The main hoop is anchored to a tube (#4) that was sectioned into the full length of the inner rocker panel. This gives it a strong anchor point, and also sets the foundation for the side impact tubing that will be added later. The detail shot at right clearly shows the massive strength of this junction. The corner gussets add lots of stiffness without adding much weight. It's an incredibly efficient, strong cage assembly, but we're not done yet! The driver's environment really starts to take shape. Tube #1 starts the process, giving diagonal strength in case of a flip. Tube #2 anchors the seat belts and further braces everything. It will eventually be extended all the way across the cabin and will also hold a fabricated seat back brace. Tube #3 is a door bar that attaches to the previously mentioned rocker panel tube, and the main hoop. The two tabs at #4 hold a right side door bar that is removable for ease of maintenance & ingress/egress. 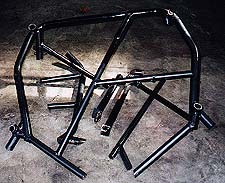 Note the front chassis tube coming through and tying into the main cage at #5. 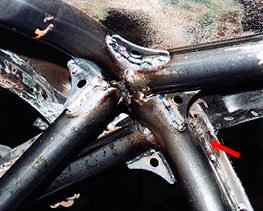 All main tubes intersect at focal strength points, making the entire chassis incredibly stiff. This allows accurate suspension set-up and tuning, and is also extremely crash worthy. The Driver Protection System continues to take form. 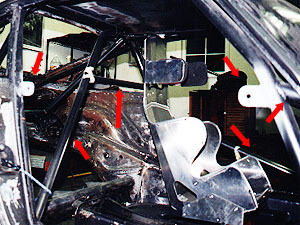 All tubes attach to the full length rocker panel tube, and at stress/strength points in the chassis (#2 & 3). This system also allows relatively easy ingress/egress from the seat. That, and the heim joint-mounted removable steering wheel (#1), which was yet another little parameter of this chassis build-up. Also, note the gentle curvature of the main door bar. This is but another tip-of-the-hat to the artistic possibilities available. It is a small detail indeed, but taken as a whole, they all add up to a very pleasing piece of machinery. Going fast is only part of the goal. Another facet is Pride of Ownership; a portion of the equation that is never overlooked at REDLINE RaceCraft ! 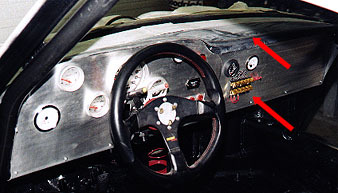 The shot at the upper left clearly shows the heim-joint -mounted removable steering wheel. 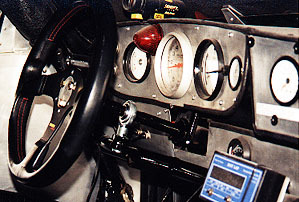 It also highlites the old dash; a mixture of gauges, surfaces, and eras. Too many panels, way too much old and redundant wiring... just a cluttered mess! Remember, this is a dedicated race car now, having only ignition, starter, windshield wiper (one! ), fuel pump, and brake lamp circuits remaining. The old harness was cut and spliced so many times that tracing a short would have been nearly impossible. You guessed it... out came the old mess, replaced by a purpose-built harness containing only what was necessary. Eight pounds of factory "spaghetti" was reduced to only SEVEN WIRES ! This complete rewiring also afforded the opportunity to locate important items in far more accessible areas, such as putting the main fuse block on the dash (#1, above right). A nice carbon fiber replica 911 dash top (#2) from Kevin Buckler at The Racers Group gives a touch of that traditional 911feel to the interior. 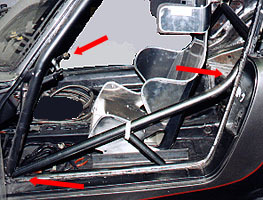 All interior panels were hand fabricated out of varying gauges of aluminum sheet, and are easily removable for access to important mechanical and electrical systems. At right, Dr. Dan works the Sweat-Equity angle once more, utilizing his surgical skills to put the finishing touches on the wiring harness. Note the big bag of shrink sleeve tubing. Another quality touch that pays dividends in appearance and circuit integrity! The Beast is Ready for Paint ! Click on the Hand Icon once more to punch out the Final Chapter !